Robyn Raya tribal affiliation with Siletz Confederated Tribe, I am an environment studies major at Heritage University. I volunteer with HUNAC on campus during events. I am a single mother of 2 school aged children and hope to make a positive impact on them as I work toward my degree in a field I am passionate about. I also hope to impact others to pursue a field they have a passion about and become great leaders and teachers to others. I care about my environment, my community and the future. Aiyana is a Nez Perce tribal member (Nimiipuu) majoring in Environmental Science at Heritage University in Toppenish, Washington. Aside from studies, Aiyana is a mother of two beautiful children and an active member in her community. She participates in a number of extracurricular activites and strives to be a positive role model. She is always searching for positive ways she may channel her adventurous and energetic spirit to initiate change. My name is Kimberly Stewart and my indian name is Sikusa, I am an enrolled member of the Yakama nation. I am currently a sophomore at Heritage University where I am majoring in Environmental Science. I chose this degree because I believe it will help me gain the necessary skills and knowledge I will need for my future career. When I am finished with school I plan on working for my tribe’s Fish and Wildlife department. The land and its natural resources are a big part of who we are as Yakamas and I want to be able to help protect and preserve it for the current generations and the generations to come. 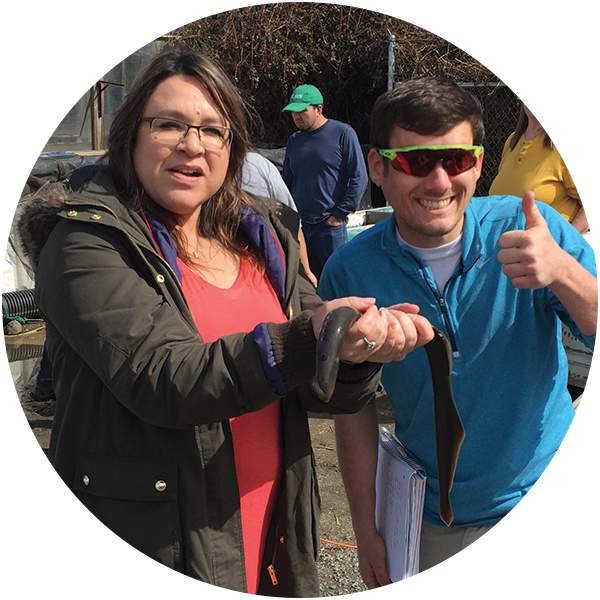 Study Title: Identifying Yakama Nation NWOK; (Native Ways of Knowing) through acknowledging Traditional Ecological Knowledge of Pacific Lamprey Harvesting Methods. I am Michael Buck, Yakama Nation tribal member who grew up on the Yakama Nation Reservation. Traditional Knowledge was instilled into me by my parents and extended family from Priest Rapids Village along the Columbia River. I feel greatly enhanced and privileged to expand my knowledge of the Scientific Method offered here at the Heritage University Environmental Science Curriculum. Math and Science are very important to me and the community of young environmentalist here at the small private institution is holistic and representative of what Native Ways of Knowing is all about. Native Perspectives in Research Methodologies. It is my great pleasure to offer the following. In the near future I plan to remain a student in higher education but also in expanding the bridge between the Traditional Western World View and Indigenous Knowledge. The goal of having a bachelors degree has only grown into a desire to pursue Mathematics and Statistics as well, the advancement of Native Natural Resources on the Yakama Nation Reservation and surrounding areas is what drives me. I enjoy hiking, competitive and fun running and picking huckleberries. Cristy Fiander, a member of the Yakama Nation is a senior majoring in Environmental Studies at Heritage University. Cristy has been on the Dean’s List since she started here at Heritage University and currently holds a gpa of 3.702. She presented at the 2016 ASIES conference in Minneapolis, Minnesota. Cristy is a member of the Heritage University Native American Club (HUNAC). Her passion is for the environment and to preserve and protect the many resources that Yakama Nation is responsible for. Cristy is a food gatherer for Toppenish Creek Longhouse. She is a head cook when called upon, as well as a Tradition food server. She enjoys being a mother of her 5 children and showing them how to live in both traditional and modern worlds.